The score for "The Golem: How He Came into the World" (1920) was written by Sheldon Brown, Alisa Rose, and Richard Marriott. The ensemble is a quintet of clarinet, violin, trombone (euphonium), contrabass, and piano. The score premiered at the Silent Movie Theater, Los Angeles on March 23, 2011 and was reprised for the Vallejo Silent Film Festival on May 4, 2018 at the Empress Theater, Vallejo. 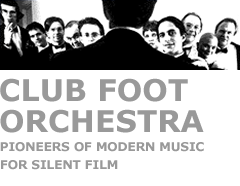 "...an enormous palette of musical influences from which Club Foot, via its founder and creative director Richard Marriott, draws inspiration. These range from Stravinsky to the imperitives of West African folk idioms, taking in account swing, jazz, rock, blues and modernist atonality." "...it was a broad mix that drew on Kurt Weill, on church chorales heard in new ways, on jazz, on minimalism, on determined tritones and on a deeply held sense of ongoing melody and variations ... At times it was hard to know what to watch - the screen with its huge vision, or the orchestra with its feverish view of the technology of music. There were big musical moments, and the versatility of the players was such that sometimes that took precedence over everything." "With the complex, aggressive score constantly changing moods this was a very dense experience, remarkable... It was especially choice to hear avant-garde jazz barrages, modern classical atonalities and electronic effects used in appropriately menacing, tumultuous scenes."